Wonderful group of professional women! This is a unique group for women in business - whether you own a business, are an entrepreneur, or work in the business world. 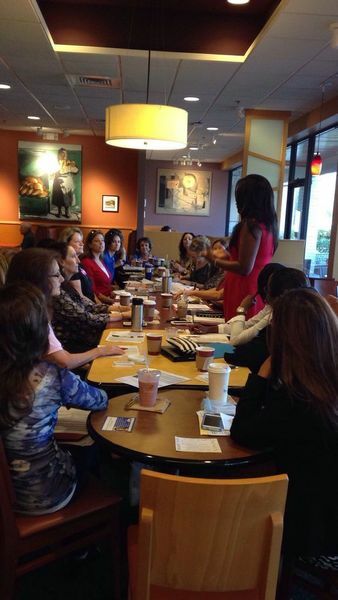 Our meetings offer the best of all worlds: networking, master minding, and business-building training. I bring my years of experience in business, networking, and coaching to the group, and will encourage the members to bring their experiences so we assist each other. My goals are for each member to make new contacts and promote her business, create productive professional relationships with other members, give and receive referrals, and learn how to create greater professional success. Together, through our combined knowledge, passion, and experiences, we can support each other to achieve our goals and dreams. Your first meeting is free. We also meet once a month in Wellington (see Wellington Women's Master Networking on meetup.com). If you appreciate the value available in this group, there is a minimal $60 per year membership fee to continue (cash or checks preferred), which includes both local monthly meetings as well as inclusion in our private Facebook group and an extended Spotlight Speaker opportunity once a year.